Graeme Davis is an English Linguist with a PhD in Anglo-Saxon from the University of St Andrews. He has lectured at the Manchester Metropolitan University, University of Northumbria and the Open University. 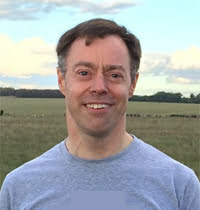 He is a tutor for the University of Buckingham’s Stonehenge MOOC (Massive Open Online Course) and is editor of the Buckingham Journal of Language and Linguistics, which has developed from earlier journals edited by Dr Davis, including Journal of Language and Linguistics and Lingua et Linguistica. He is series editor of two Peter Lang monograph series, Contemporary Studies in Descriptive Linguistics and Studies in Historical Linguistics. He is also an academic advisor to the Fara Heim project for academic research around the history and archaeology of Hudson Bay and the Canadian Arctic. His research interests include the mediaeval Germanic languages and cultures of the North Atlantic region. His book Contemporary Studies in Old English and Old Icelandic was supported by a British Academy research grant and by the University of Iceland. Early English Settlement of Orkney and Shetland examines the cultural and linguistic background of the Northern Isles, while Vikings in America sets out the story of the Norse discovery and settlement of North America. Lexicographic work includes Dictionary of Surrey English, while the discipline of surname study has been developed in Research Your Surname and Your Family Tree. An author of more than two dozen books and dozens of articles, Dr Davis has produced both primary research and popular accounts which seek to make scholarship accessible to a wide audience.